I have high hopes for Enemy Front. Any shooter that's set largely in the Warsaw Ghetto during the Second World War raises narrative expectations beyond the usual bang-bang silliness by default. After all, you don't want to trivialize one of the most horrific examples of mass human suffering in modern history. Which is probably why this new multiplayer trailer leaves me feeling just a little bit nervous. On the surface, it looks like a fairly conventional spot of online shooter action, with a bunch of dudes running around shooting a bunch of other dudes with a variety of era-appropriate weaponry. But as a major component of a game that will—again, hopefully—delve at least somewhat meaningfully into the atrocities and horrors of war, it sticks out like a sore thumb. A videogame based on the reality of that time and place is perfectly acceptable (and, I'd go even further to say, long overdue), but turning that setting into just another deathmatch arena seems not only wasteful but also suggests that Enemy Front may not have quite the gravitas I'm wishing for. It also makes me think back to comments by Spec Ops: The Line lead designer Cory Davis on that game's multiplayer, which he said "sheds a negative light on all of the meaningful things we did in the single-player experience." It is admittedly premature to make such a judgment about Enemy Front, but it's hard not to notice the parallels. 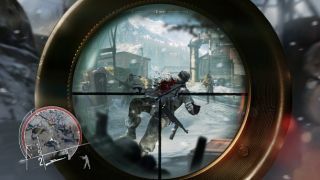 Enemy Front, from Sniper: Ghost Warrior developer CI Games, launches on June 10.